Elton John's Goodbye Yellow Brick Road has proved to be one of his most popular and enduring works. The man at the controls, David Hentschel, tells us how it came to be. 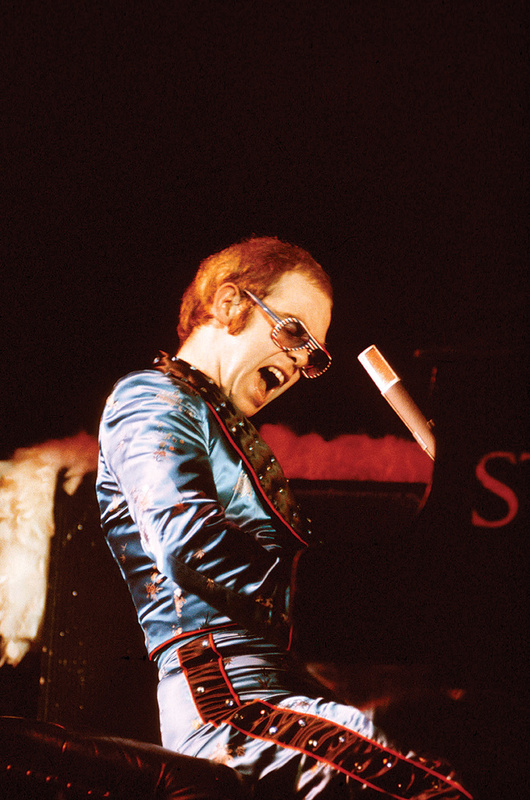 In January 1973, Elton John was reaching a career apotheosis. His sixth studio album, Don't Shoot Me I'm Only The Piano Player, was released amid widespread acclaim en route to topping the charts on both sides of the Atlantic, and that record's first single, 'Crocodile Rock', was also on its way to becoming his first American number one. Nevertheless, suddenly tagged with the 'superstar' label after more than a decade of earning his stripes in the music business, Elton knew better than to ease off the accelerator just as he was hitting cruise speed and high altitude. Instead, the singer-songwriter formerly known as Reginald Kenneth Dwight opted to capitalise on his exploding international status — and comply with a two-albums-per-year contractual obligation to MCA — by commencing sessions for another new collection of songs penned with lyricist Bernie Taupin. Impressed that the Rolling Stones had recently been recording tracks for Goats Head Soup in Kingston, Jamaica, Elton also opted to work there. 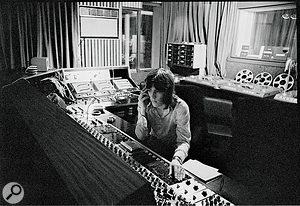 It was a decision he, Taupin, producer Gus Dudgeon and the band members — guitarist Davey Johnstone, bass player Dee Murray and drummer Nigel Olsson — quickly regretted, thanks to the economically depressed locale's tense, violent atmosphere and a studio that fell far short of professional standards. 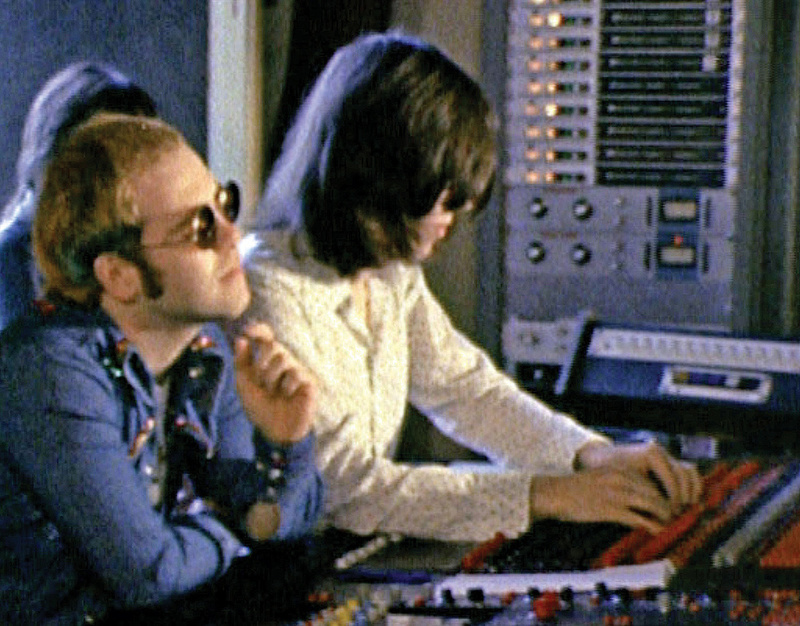 Elton John and David Hentschel at the console in the Château d'Hérouville. The John/Taupin system of co-composing separately has been well documented down the years: Bernie writes the lyrics by himself and hands them to Elton, who then very quickly sets them to music. For the longest time, there was no interaction between them as songwriters, and this was still the case at the start of 1973. After Bernie had crafted many of the lyrics for their latest collaboration, Elton — avoiding the riots outside — spent three days composing the music in his suite at Kingston's Pink Flamingo Hotel. The only new song to be tracked, however, was a subsequently shelved version of 'Saturday Night's Alright For Fighting' — likened by Elton to having been "recorded on the worst transistor radio” — before the decision was taken to quit Jamaica and relocate to the far more familiar and relaxed surroundings of Strawberry Studios. A residential facility, this was housed within the rural and remote 18th century Château d'Hérouville, located in a village within the Oise valley just outside Paris, where Elton and his fellow musicians had tracked the Don't Shoot Me... album and its predecessor, 1972's aptly named Honky Château. Equipped with an MCI 416 console and 16-track Ampex machine, Strawberry's small control room and more spacious live area were on the château's first floor. There, courtesy of two walls of double-glazed windows, everyone was afforded good sound isolation from the outside, plenty of natural daylight and extensive views over the surrounding corn fields. 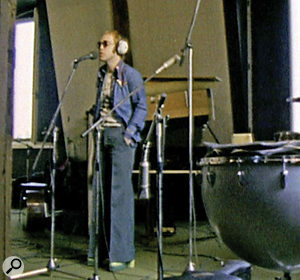 Elton John in the Château d'Hérouville's live room. Behind him you can see Gus Dudgeon's piano isolation box on top of the grand piano. Born and raised in Lindfield, West Sussex, Hentschel began life as a classically trained musician, learning to play the piano, church organ and clarinet. This was while he simultaneously harboured a love for the pop and rock that he heard on early Beatles albums and, a little later on, records by Captain Beefheart and the Velvet Underground. 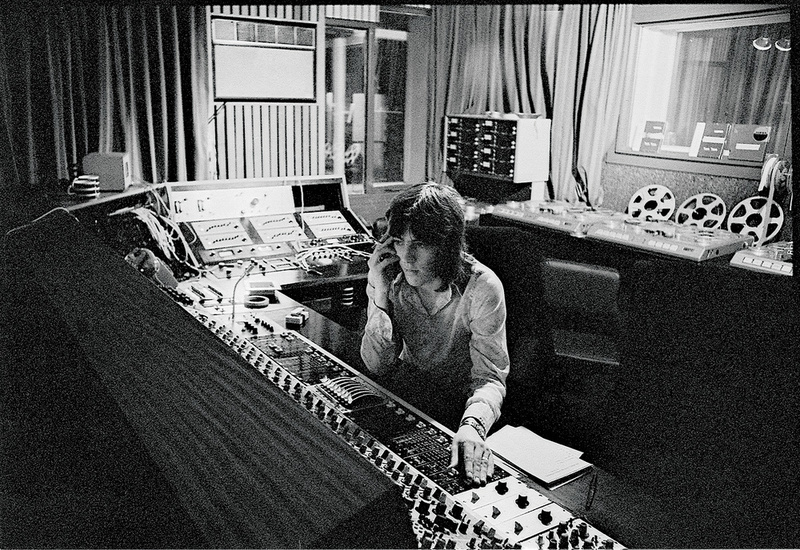 Playing keyboards in school bands, he also developed an affection for soul and jazz, and it was with this broad musical grounding that, as a 17-year-old in the summer of '69, David Hentschel took advantage of a pre-college gap year to land a job as a tea boy at Trident Studios in Soho. What's more, Hentschel would soon also be working with Bowie when the latter produced Mott The Hoople's classic All The Young Dudes album, only to quit after a week due to a good old "clash of personalities” with frontman Ian Hunter. Beforehand, Hentschel had assisted on Van der Graaf Generator's H To He, Who Am The Only One. This was produced by John Anthony, who'd ensure that Hentschel engineered Van der Graaf Generator's next LP, Pawn Hearts, in 1971, as well as Genesis' Nursery Cryme that same year. 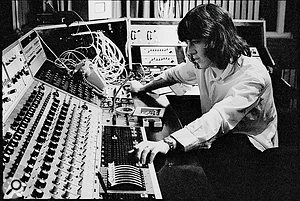 In the meantime, having been a second engineer during the mix of a track on Elton John's 11-17-70 live album, Hentschel assisted on his next studio project, Madman Across The Water. This was after the sessions had switched from Kingston to the Château d'Hérouville where, according to Bernie Taupin, he and Elton enjoyed "a new lease on life and a new enthusiasm for writing”. Such was the case with the re-recording of 'Saturday Night's Alright For Fighting', which was captured live without so much as a run‑through. 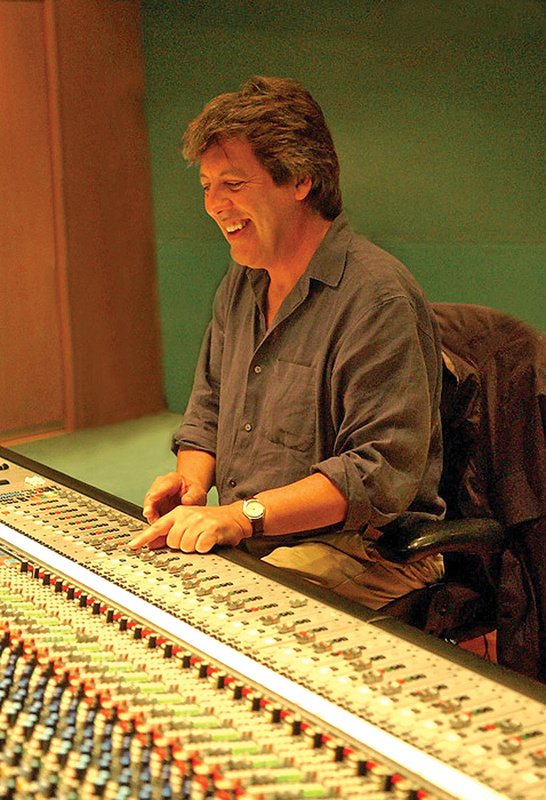 Another shot of David Hentschel at Trident's Sound Techniques console. While the studio's live area was only large enough to accommodate a four-piece band and a seven-foot grand piano, audio separation was enhanced by Gus Dudgeon having previously commissioned a wooden box to be constructed and placed over the piano instead of the instrument's own lid. "The box was a couple of feet high, so there was enough space to fit in a couple of microphones while achieving a degree of separation from the drums,” Hentschel says. "There were no isolation booths, so everyone just set up in the same room. We screened off the guitar amp and the bass amp, and Elton alternated between the grand piano and electric piano while putting down a scratch vocal with each tune. Then, the day after recording a track, we'd overdub his lead vocal and he was done. Bless him, he gets terribly bored in the studio — he's got no patience for fiddling around with overdubs and doing backing vocals. So, during those sessions, he'd do his bit and bugger off into Paris, where he'd visit Yves Saint Laurent and buy 20 pairs of trousers in different colours along with loads of jewellery and God knows what else. "Sound-wise, the main room was kind of no man's land. It was carpeted and it certainly wasn't very live — in those days, few pop and rock studios were. So, at the château, looking through the control room window, Nigel Olsson's drums were near the far left corner, Elton's piano was to the right of them, Dee Murray's bass was on the near left side and Davey Johnstone's guitar was on the near right. "The bass drum, which had the front skin off, was miked with [an AKG] D12; there probably would have been a small Neumann [KM]56 pencil condenser on the snare; long [AKG] C28s on the tom‑toms; either [Neumann] 67s or [AKG] C12as for overheads; and, on the hi‑hat, whatever directional mic they had there. Then, for the bass, I would have had a DI as well as a 67 on Dee's Ampeg cabinet, while a C12a would have been on the guitar amp along with two 67s on the piano and a 67 for Elton's vocals. "The songs were recorded in about two weeks. We did all of the backing tracks, all of the guitar overdubs, any obvious keyboard overdubs, and all of the lead and backing vocals. Davey, Dee and Nigel were a fantastic unit. They had three completely different voices, but because they'd been doing it so long they had this blend going and it was just incredible. I'd put the track up beforehand and we'd work out the parts together in the control room, with me chucking in a few notes for harmony. Most of the time, however, they would naturally fall into the right parts — it was quite extraordinary — and then we'd double or quadruple them while a couple of the guys might change some of the parts around so that the same voices weren't doubled. There'd be different voices doubling the same parts to make the whole thing sound thicker, and we'd just bounce them down as we went along. David Hentschel at Abbey Road today. If Goodbye Yellow Brick Road has a theme, it is one of nostalgia for the simpler pleasures and experiences of a pre-fame childhood. Not that this childhood necessarily belonged to Elton Hercules John. Certainly, he may have shared Bernie Taupin's yearning for old-style Hollywood glamour, as represented by the yellow brick road that led to the Emerald City in 1939's epic movie The Wizard Of Oz starring Judy Garland. However, since Elton grew up in the London suburb of Pinner, it was somewhat incongruous for the title track to feature him singing, "I should have stayed on the farm” and "I'm going back to my plough”. Instead, just as 'Saturday Night's Alright For Fighting' referenced memories of the Aston Arms pub in Market Rasen, Lincolnshire, where Bernie used to hang out in his teens, so 'Goodbye Yellow Brick Road' alluded to his humble beginnings as the son of a farmer. 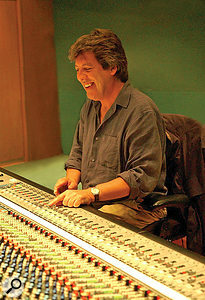 "As with everything, he did his vocals very quickly,” adds David Hentschel who, after leaving Trident in 1974, wrote the theme music for the films Educating Rita and Operation Daybreak; established one of LA's first dedicated MIDI studios while living there in the mid-'80s; and is currently part of a four-man transatlantic production team. "There was no comping. We might patch up or do a verse again, but there was very little compression or fiddling about. Elton just did it. Again, this goes back to being in the zone and concentrating. He's a thorough professional. When he sang, all of the expression and dynamics were taken care of. It was unbelievable, really. "Then again, Gus Dudgeon was a very personable man with a huge knowledge of music. His love of music was infectious and he was all about creating a good environment and making sure everyone was happy. He was an absolute master at getting the best results by knowing how to treat the musicians and others he was working with. "The only thing that caused a problem on 'Goodbye Yellow Brick Road' was the effects pedal that Davey used on that song. It may have been a Mu-Tron and it produced these incredible transients. We didn't see them with the equipment that we had, but when we mastered the track we had terrible trouble with it distorting because of all the hidden transients in this bloody guitar. It was double-tracked left and right and the cutting lathes didn't like it at all. It was extremely difficult to master to disc anything that was really, really quiet, so we actually had to go back and remix it and use some very judicious limiting. Widely regarded as Elton John's best album, Goodbye Yellow Brick Road is certainly his most popular record, having notched up worldwide sales in excess of 31 million copies after topping the US chart for eight weeks in 1973. It also went to Number One in the UK, where the title track peaked at number six. In America, it reached number two. Borrowing from a line in 'Goodbye Yellow Brick Road' — "It'll take you a couple of vodka and tonics to set you on your feet again” — one of the album's working titles was Vodka & Tonics. Another was Silent Movies, Talking Pictures, and it was with this in mind that Gus Dudgeon originally intended to open the record with the type of Twentieth Century Fox‑style signature music that precedes the start of each film. Then, when the necessary licensing couldn't be obtained to use such music, something else had to be added to the front of the opening track, 'Funeral For A Friend', which segues into 'Love Lies Bleeding'. "I therefore went away with a rough mix of 'Funeral For A Friend', thought about it for a couple of days and came up with these oblique, three‑note references to other songs on the album; 'Candle In The Wind' being one and 'The Ballad Of Danny Bailey' being another. I created a funereal, atmospheric kind of piece and recorded it on the 16-track at Trident with the ARP 2500. Released in the United States as the third single from the Goodbye Yellow Brick Road album following 'Saturday Night's Alright For Fighting' and the title track, 'Bennie & The Jets' became Elton John's second American chart‑topper.